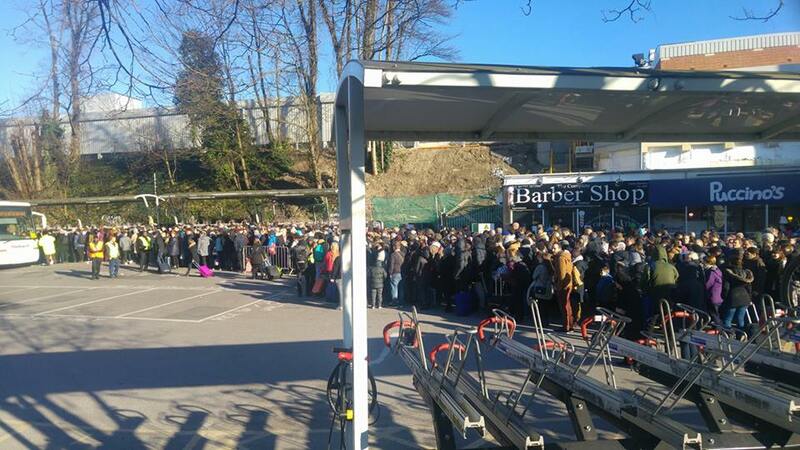 You will likely have heard about the issues at Redhill Station on Sunday 25 February – when thousands of passengers were left stuck trying to complete their onward journey to Gatwick and the south coast by a lack of Rail Replacement busses. If you saw that (and our response to it last weekend) and feel like you were missing out by not being involved your luck is in, as it looks like it will be a very similar story this weekend when the same engineering works take place. 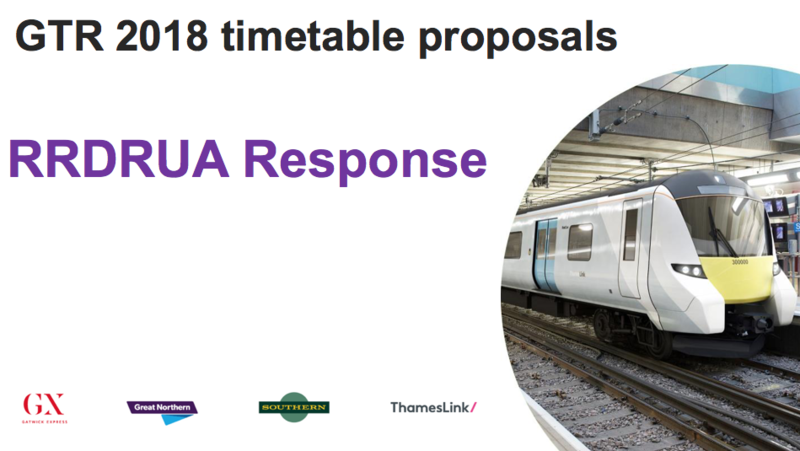 As a local rail users association we wrote to Southern Rail in response to their plans before the issues happened, and we’ve been speaking to them again since in a bid to secure a better service over the next two weekends when the same line closure is happening. The bad news – they’ve not really doing anything to solve the problem at Redhill on the trains although they’re going to give running busses a better go. On the face of it this weekend they’ll be doing what they should have been doing last weekend on the bus front. However there simply won’t be enough trains. Passengers at Merstham and Coulsdon South were unable to board services last Sunday as they were full. The issue isn’t really being dealt with. All that’s been added to the Redhill route is the 4 extra coaches on the Victoria – Tonbridge (via Redhill) route. The capacity issue is made worse as everyone from London Bridge will be turning up at East Croydon to board these services too – as the Thameslink trains south will not be running at all. There should be more trains per hour provided to cope with the passenger demand in both directions. Oh and not to mention Brighton at home against Arsenal this weekend. If you need to get to Gatwick on Sunday 4 March you have several options, and most of them involve not using Redhill at all. – An additional hourly service will run from Victoria to Horsham (via Dorking) meaning you can get to Gatwick on that – the train takes a big loop through Dorking down to Horsham, Three Bridges, and then Gatwick. It’ll be a 10 or 12 car train! – You can also get one of the 2 trains per hour to East Grinstead from Victoria, and then transfer to a bus to Gatwick Airport. The Tonbridge train will now be 8 coaches instead of the 4 that it was last weekend. The Victoria to Redhill trains will be 12 coaches again. 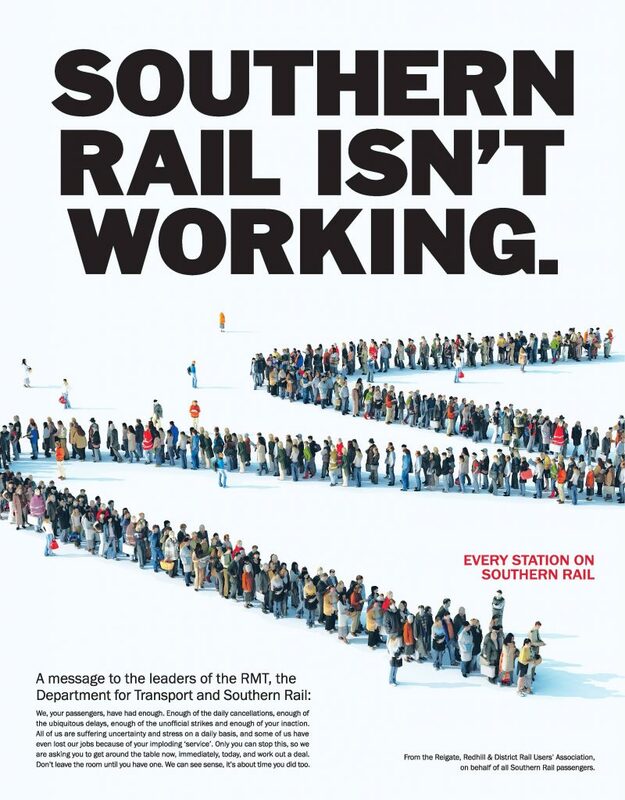 Southern also tell us that they have extra standby busses to support the demand if needed, and some of the busses will run direct from Redhill to Gatwick Airport without pulling into all the other stations. They also tell us that an ’emergency train’ will be sitting at Victoria in case it’s needed (why they don’t run it we don’t know). At Redhill they tell us they’ll be doing a better job of making sure people and busses are managed effectively. There will be extra staff and bus controllers. The carpark at Redhill will be used to marshal people onto the busses with clear options for each destination. Now other Train Operating Companies take note – this sneaky tactic by Southern Rail is one you should be copying. Here’s one simple move you can use against your paying commuters to remove all responsibility to get them to where they paid to be taken to – and avoid Delay Repay or the need to put on replacement busses. It all starts with some careful planning and the intention to not run a train that is in the timetable. Simply don’t send the train…leaving the passengers standing on the platform or struggling to get home – but you have to do it in advance. By doing it in advance you have the sneaky sneaky option of deleting the train from the timetable. Don’t report it as delayed or cancelled. Just delete it like it was never meant to be there. This is brilliant, because people turn up at the time they would expect the train to run – you know because we plan ahead like the station announcements always tell us to do – some of the non season ticket holding customers even buy a ticket at the station. But when they turn up at the platform, the information board is simply blank. When they check their handy train time application – the train doesn’t appear to be showing in the timetable. What’s more – you don’t have to provide any rail replacement busses, because the train was never in the timetable for the day. 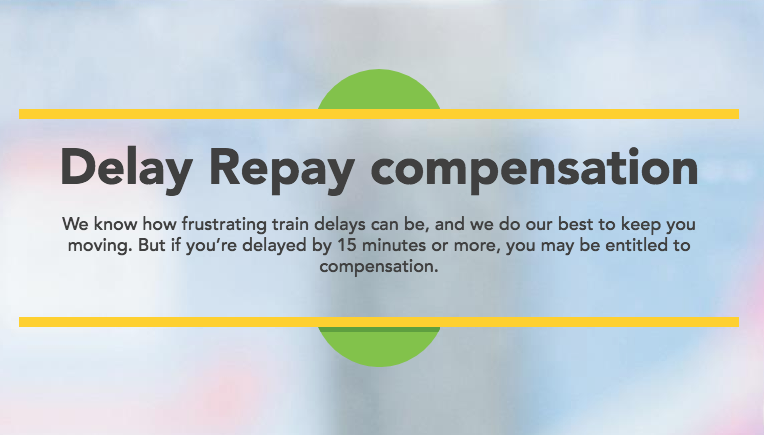 And finally – when those angry commuters fill in the delay repay forms to claim compensation for the lack of train and the disruption of their journey – you can reject them – because you never timetabled it. If you want to see this tactic in operation first hand – head to Reigate station in Surrey. Southern do it here quite a lot! Southern Rail via Twitter now say that despite these trains being deleted from the timetable you can claim Delay Repay so we’re really like to hear from commuters who have tried and if you’ve been successful. Please let us know in the comments below. However it’s still apparent that deleting the train from the timetable removes their responsibility to put on Rail Replacement busses. Redhill chaos: And there’s 2 more weekends like this to come! As Passenger Directors of GTR Southern and GTR Thameslink I direct this email at you. We tried as a Rail Users organisation to ask for better provision of services around the major closure between Gatwick and Redhill this Sunday (25/02) as we foresaw your plans were inadequate. We wrote to you and your teams several times concerned about the lack of service but only received replies from junior members of your team who didn’t seem to understand the problem. This is something you and your senior teams should have been on top of. Today (Sunday) we have sadly been proved right. The situation at Redhill is extremely dangerous, not helped by the inadequate subway at the station that needs replacing anyway, inadequate space for buses to turn round and there are hundreds of passengers running all over Redhill Town centre trying desperately to get to their destinations by taxi or whatever other means they can find. There is obviously not enough trains to get passengers to London nor are there enough buses to get people to Gatwick or the South Coast. I have just driven past the station and there are people running across the main road with heavy cases. The situation is not just at the station but right into the town. I can see the police have been called to assist with the chaos your Company has created. After the problems at Finsbury Park with overrunning engineering work in Christmas 2016, and at London Bridge the first day of the service cuts, we would have thought you would have tools to measure what is required for adequate provision of service. It sadly seems not. I trust that you and Network Rail will cancel the next two weekends line closures until a point where you can work together to find a proper and safe solution. We look forward to finding out how you will be doing this in future and happy to discuss if it will help. Crispin Blunt MP is delighted that the Rail Minister has responded to local rail users’ prolonged campaign for fairer fares, with a series of ticketing measures announced today. Firstly, customers with (or purchasing before 1st January) Southern Only season tickets will have their ticket upgraded so they can use all Thameslink services (all services except Gatwick Express). Secondly, regulated fares for customers travelling from Redhill, Reigate and other local stations* will be frozen. The average increase of 3.6% will not apply to these local stations, in recognition of the relatively higher prices rail users have been paying on this part of the network. 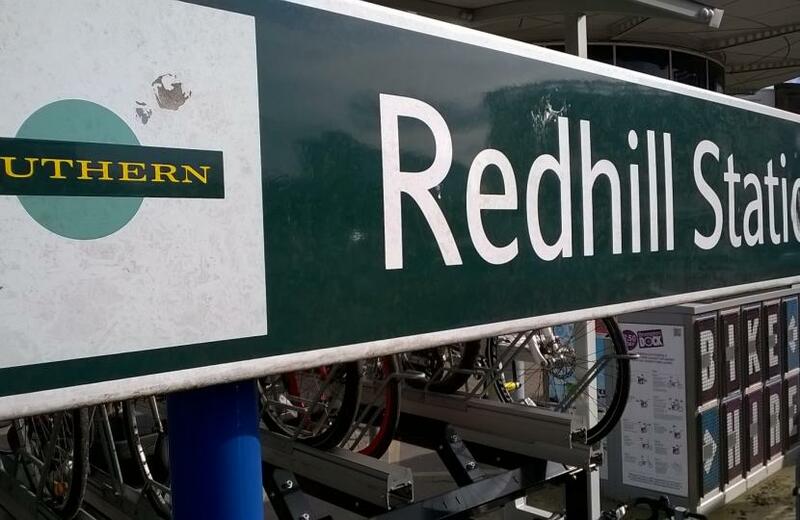 Thirdly, the Rail Minister, Paul Maynard MP, has initiated work that will look at options to rectify the injustice of higher fares at Redhill and local stations – known as the ‘Redhill Hump’ – with a view to implementing changes before the end of the life of the current Govia Thameslink franchise in 2021. This should also enable the new fare structure to take advantage of future ‘smart ticketing’ arrangements. Fourthly, they are looking again at the May 2018 timetable to see if it can further improved for Redhill commuters, but all parties recognise the difficulty. These undertakings were made at a meeting with the Rail Minister and his key officials on Wednesday. The Minister and his team acknowledged both the strength of the Reigate, Redhill & District Rail Users’ (RRDRUA) campaign and that they have a good case. “After a prolonged campaign for fairer fares, I’m delighted that Redhill and Reigate rail users have been given a Christmas present in the form of this fares freeze and a Ministerial commitment to try to address the historic anomaly of higher fares for passengers using Redhill, Reigate and other local stations. “Our campaign has been going since 2014 and I am grateful that we have a Rail Minister who is finally demanding regular updates on how the system can address the unfairness to local commuters. My train has changed from a Southern service to a Thameslink service and I hold a “Southern only ticket”. Is my ticket still valid? If your ticket says ‘Not Gatwick Express’ or ‘Any Permitted’ then you can continue to travel as usual. If you have a ‘Southern only’ ticket, this will be valid for travel up until 31st January 2018 on the new Thameslink trains. After this time, you will need to change your ticket for a ticket that says ‘Not Gatwick Express’ or ‘Any Permitted’. Please speak to the staff in the ticket office on how to do this. If you hold a season ticket with an expiry date after 31st January, please visit the station to change your ticket free of charge as soon as possible. 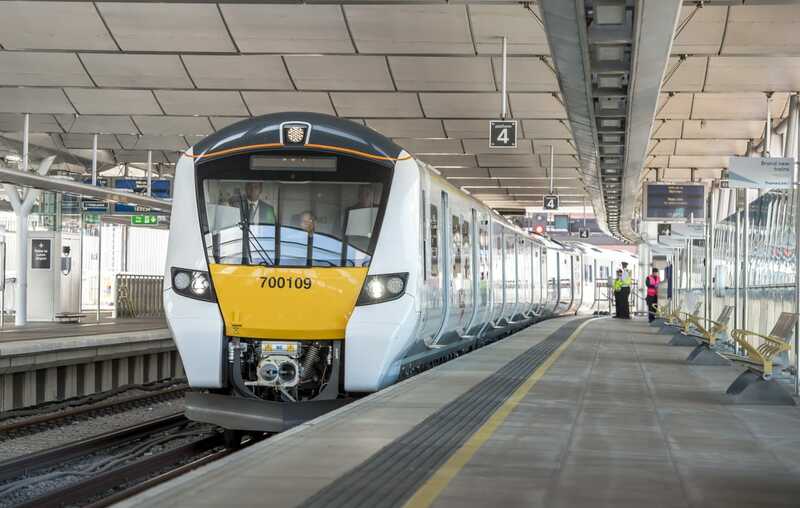 This will result in a simplified fares structure for customers in line with timetable changes being made in relation to the Thameslink programme. GTR Southern surprise thousands of Redhill, Reigate and Horley rail users at Christmas with a sneaky 14% Fare Increase! Many fares along the Redhill route subject to stealth increase of up to 14% on Monday 10th December which has not been communicated to passengers. This increase is on top of the previously announced 3.6% annual increase due in January – thus together hard-pressed commuters will find their fares will rise by 17%. Commuters on Monday morning will, without warning, find a special Christmas present from Southern, some of their daily trains will have transferred to Thameslink and their “Southern Only” tickets will not be valid on the replacement trains, forcing them to pay higher fares on the new Thameslink services. Both Thameslink and Southern are operated by the same parent company GTR. And to add further misery to commuters the new ‘improved’ Thameslink services have less seats than the Southern trains they replace. 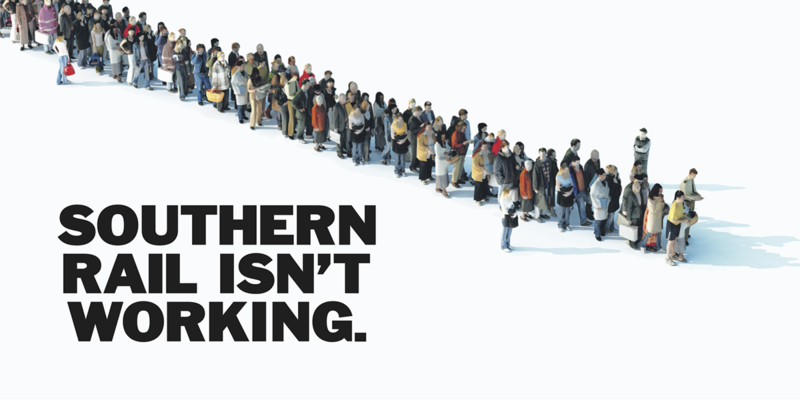 GTR are offering to replace cheaper “Southern Only” tickets with more expensive ones, as the majority of tickets used are “Southern only” this creates a price rise as there will no longer be Southern Services. No Solution in place even for Season Ticket Holders of “Southern Only” tickets bought in good faith that the service would continue. The “Department for Transport” are fully complicit in this change, it is there responsibility to prevent this kind of problem from happening. The DFT have directed the change of service provider but not engaged on the effects with local passengers. RRDRUA have written several times to make them aware of this enforced price rise and also on the “Redhill Hump” where fares from Redhill route are between 11 and 40% higher than other nearby stations in the first place. DfT have refused to engage or even assist local passengers on this. We have written to Chris Grayling Secretary of State and have met with Paul Maynard Transport Minister. Mr Maynard promised a solution for the Redhill route in September but has not yet made any suggestions. In 2015, over 3,300 Redhill Route passengers petitioned for London Zone 6 pricing to make the fares fair from the Redhill route. Oyster readers have been installed along the line but are the only Oyster readers in use that do not guarantee the lowest fare and often paper tickets are cheaper – adding to the loss and confusion felt by thousands of Redhill passengers daily. Thameslink – Southern services to London Bridge are being taken over by Thameslink in May 2018. As part of this shift key peak trains are changing in December 2017. In the FAQ section here https://www.southernrailway.com/travel-information/plan-your-journey/timetable [Screenshot]. “My train is changing from a Southern service to a Thameslink service. Is my ticket still valid? The provisional date for the 2017 Reigate, Redhill and District Rail Users Association AGM has been set for the Thursday 30 March, 19.30 in the Harlequin Theatre, Redhill. Our annual AGM is more than just a formal meeting of members of the rail user group. We also invite representatives of the Rail Operating companies to share news, updates, and answer questions. And we’ve already had confirmation that Angie Doll, Passenger Services Director for Southern will be attending. Entry to the AGM is for full members only. If you’re interested in attending membership is just £5 and you can find our more on our membership page. 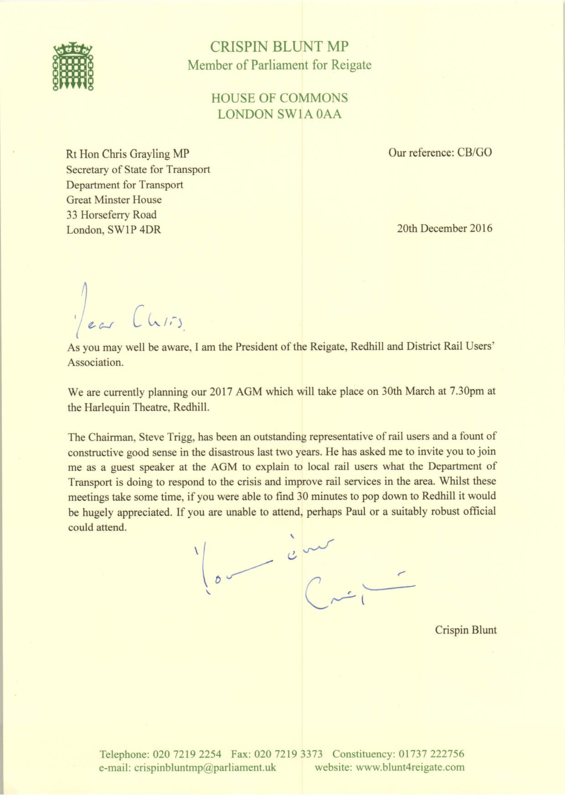 Yesterday the RRDRUA President Crispin Blunt MP has written to Chris Grayling asking for his attendance too. A copy of the letter can also be downloaded in PDF. The RRDRUA has sent and published the following open letter to the Prime Minister. A PDF copy is also available for download. The Residents of Southern England are fed up with the continuing disruption to their daily lives cause by the problems at Southern and Thameslink Railway companies. The key fact in this disruption is the Industrial Dispute about Guards on trains and station staff. This dispute is leading to the breakdown of family life, health / stress issues and the reduced productivity for British Business lost waiting for trains that don’t run. We have listened to your rhetoric about your government being for the ordinary people of this Country. We are Ordinary people and call on you to intervene directly in this dispute, to get it resolved quickly and swiftly for all our sakes. It is no good stating this is a dispute between GTR and the Unions because that is not totally correct. Your Department for Transport is demanding modernisation which the Rail Company is trying to implement so your Government is a fully responsible party to this dispute. As this is an open letter we also call on the leaders of ASLEF and the RMT to come back and negotiate swiftly on these issues with an open mind, whilst suspending all strikes and overtime bans. Entering the room and just saying no is inexcusable. It doesn’t help your members or the passengers they serve. Come into the room with proposals that will resolve the dispute and make Driver Operation work. The world has moved on and technology is improving safety and process throughout life and you and your members need to embrace this. On Board Staff on all non-metro trains who are safety trained to evacuate trains in live rail situations. During disruption to avoid cancelling trains where On-Board Staff are delayed, drivers able to take trains without on-board staff to avoid further disruption to passengers, with processes in place for on-board supervisors to be placed on train as soon as reasonably possible. In Conclusion, we ask Prime Minister, that you personally get around a negotiating table with the leaders of the RMT and ASLEF and create an agreement perhaps along the lines of our suggestions that can get Southern England back to work and resolve the issues once and for all. When this is complete can you look to your Governments Infrastructure and Projects Authority to invest in much needed improvements to the Brighton Main Line, which includes for us Redhill Line passengers, a flyover at Stoats Nest Junction, Remodelling of Redhill Stations and Platform 3 at Reigate Station.